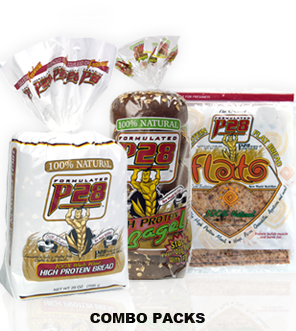 Many people ask me about the flavor of P28 Bread Products since they are high protein food items and packed with nutritious ingredients. A common assumption is that because of these features, the bread is lacking in flavor. Believe me when I say that P28 Food Products are absolutely delectable! I frequently get cravings for the bread products because they are tasty and substantial. These products freeze well so you can store them and simply toast the portion you want to eat each time. I cannot mention the bread products without also mentioning the INCREDIBLE nut spreads that are part of the P28 Foods lineup! Here is a description of each flavor that is available. Yes, they are all delicious! P28 High Protein Peanut Butters are All Natural and jam packed with 14 grams of Protein per serving. Our Spreads also have No Sugar Added, 0 Sodium, 0 Trans Fat, and are Cholesterol Free. Our Spreads are made with the absolute highest quality ingredients, including Whey Protein Isolate – the highest quality protein source on the market today. Signature Blend – The P28 Signature Blend is an amazingly delicious mixture of high quality Almonds, Peanuts, Cranberries, Sunflower Seeds, Honey, Flax Seeds, Cinnamon, and Whey Protein. This is an extremely nutrient rich blend high in Protein and Omega-3’s. Almond Butter – Our P28 Almond Butter is a smooth and tasty mixture of high quality Almonds and Whey Protein. Our Almond Butter is an excellent source of Protein, Vitamin E, Magnesium, and Fiber. White Chocolate – The P28 White Chocolate Spread is an amazing combination of high quality Peanuts, White Chocolate, Vanilla, and Whey Protein. Our White Chocolate Spread is incredibly tasty and nutritious. With 14 grams of Protein per serving and made with such high quality ingredients, you’ll never have to feel guilty eating P28 White Chocolate Spread! Banana Raisin – Our newest flavor! An amazing mixture of Dry Roasted Peanuts, Whey Protein Isolate, and of course….RAISINS! With 14 grams of protein per serving and only 7g of carbs, this is a must have Spread in your arsenal! Also watch for William “The Breadman” Sullivan IFBB Men’s Physique Pro as he hits the globe with these amazing products!